Walkers Are Too Rare In Higher Levels. Everyone knows that walkers are rarer in the higher levels. Not as rare as the RARE infected but it's kinda close and it annoys me. I had an infected bounty where I need to get 5 Runners and 30 Walkers in Brookvale West so I did a mission there. After the mission I ended up with 101 Runner kills and 7 Walker kills (I have a picture but I don't know how to add it here). So Con Artist Games, please remove walkers in infected bounties in higher level areas. Or add a horde rush but instead of runners it has walkers... lots of walkers from all directions and it will be called Horde Swarm. Agreed. 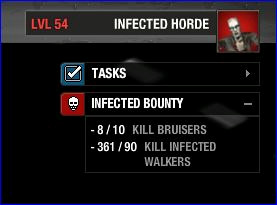 At 55, you get bounties that require 155-ish walkers. I've been averaging 4-5 missions just to get the walkers. If there was a book to *decrease* rare spawns and increase walkers, this would be fine. Or as the OP suggested a swarm of walkers instead of runners. As it stands, a rush basically screws you out of 2-3 waves of spawns that had chances for walkers. Perhaps make a book to make rushes walkers? Guess what I'm really saying here is we need a way to influence spawn chances for walkers. Okay, bounties were far too easy until the latest major overhaul, but now they are stupidly hard. I will need to run at least four, possibly five, missions just for one map! If you are going to give us hoodies, hoodies, and more hoodies in the bounty boxes, can't you tweak the program from ridiculous to merely difficult. Oh, and please tell me the program doesn't send rushes when you need walkers. I feel like that the change to remove time limit on the Bounties is the best thing to happen to them. Now they aren't in any way impossible because you can do just one or two mission a day and still eventually complete the bounty. The only gripe for me is having to grind 200 walkers/runners in misisons 10 levels below my leader and survivors. It is not only about walkers ... it is about RNG in general. Sometimes in takes me 8-10 missions to kill 10 bruisers because they just don't show up. Even with DMU infected bounties are time consuming and kind of annoying. Maybe we can get a guaranteed reward in just one slot? Thanks for uni token, premium and lvl 3 keycards from bounty boxes .... much appreciated. That's it ... everytime you need walkers you get at least one rush each mission. If you need runners .... all Zeds just walking. Something to add: I n new maps are "Riots" and "Herc Riots" they nearly looks the same but only "Riots" count to infected kills. Kinda stupid in my opinion because all are just "Riots". Edited by Cherry, 27 August 2016 - 07:35 AM. I totally agree, the walkers become a real pain, the actual infected bounty seems to be an endurance test. I run usually 5-6 mission/map to complete it. This is boring, especially without DMU. Walkers aren't the only thing that's super rare, so are bruisers and police infected. I've run at least 6-8 missions in uptown to kill 10 bruisers. Exactly. Bounty requirements should be tied to spawn rates on a PER SUBURB basis. Its not a question of hard or easy. Its about knowing how hard the requirement is. When requirements aren't tied to actual spawn rates, some are crazy easy while others are crazy hard. Removing time limits as an OK stopgap, but why not just revisit the requirement setting code and write it to reflect real spawn rates? Simple, done, complaints will disappear. SAME SAME i have DMU and somehow it takes me an hour running missions one after the other to just get walker kills. IM LEVEL 36 AND FIND 2-% walkers per mission. I actually ran 3 missions in a row without getting a single runner recently (Green Plains), that included rushes, but I put that down to the hiccup with terrordome and bounties.